I'm happy to share some exciting news with you girls! 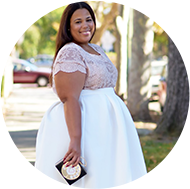 Cece Olisa, from Plus Size Princess and I have put together an event that we're calling theCURVYcon. theCURVYcon is a one day event in NYC where we can Shop Curvy. Chat Curvy. Embrace Curvy. The day will be filled with panels from our favorite bloggers, YouTubers and fashionistas. There will also be plus size fashion showcases and of course... shopping! Our first round of VIP tickets will go on sale March 13th at midnight, but you must be a CurvyVIP for access. Become a CurvyVIP here. Update* Of of course we have to give away a few tickets before they go on sale March 13th. Enter below and good luck!